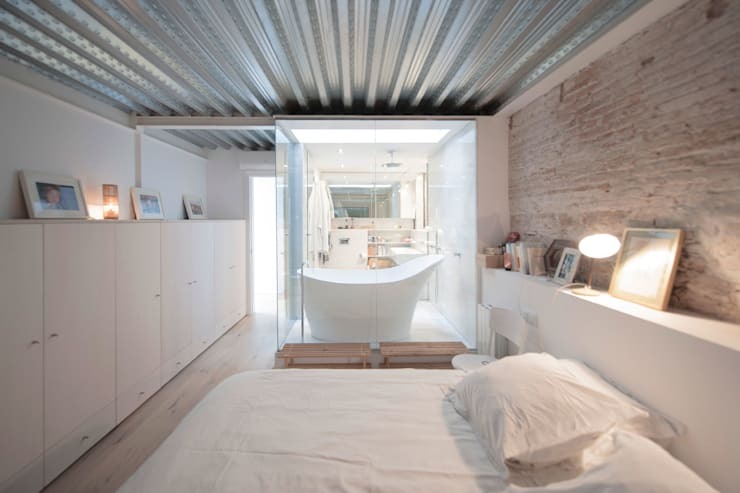 Create a bathroom inside your bedroom! But back down to earth, it's a very real fact that most ensuite bathrooms lack a bathtub because there is just too little space. If you consider that there's arguably more floor space in most master bedrooms, installing a free standing tub in the bedroom is actually quite a practical choice. To add to the romance, we now have the conveniences of modern plumbing and a better standard of living. So unfortunately, the attendant needs to go, but you can get your own accessories sorted. So let's get on with exploring a few options and explore a short guide on how to create a bathroom in your bedroom. Enjoy! Later on, we will explore some ideas about choosing a space, but before you start, it's a good idea to sketch out a diagram of the underground piping and any electrical outlets and wiring that is hidden out of sight. Water and electricity do not mix, so the location of these elements may determine the layout of your bathroom to some extent. The water pipes can be modified to suit, but it will quickly get very expensive, so it's best to try and work with the existing piping. Another key issue is your ventilation. Steamy water in a badly ventilated room will caused problems with rising damp, mould and condensation. Make sure you have your windows open when the bath is being used or better yet, install an extractor fan. Your standard bathroom contains way too much storage and accessories to consider replanting in your bedroom. Strip it right down to the essentials, and consider using the main bathroom for storage. Your bedroom-bathroom, is best kept minimal, with a beautiful free-standing bath and a few, handy accessories. 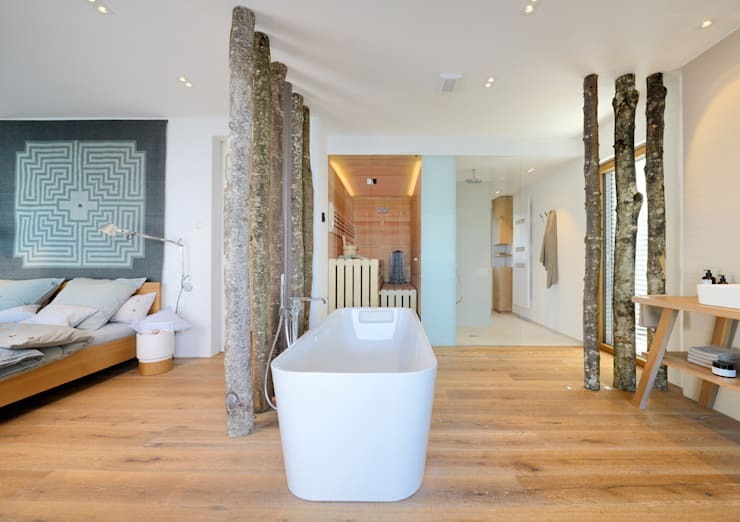 Here we can see how beautifully a simple bathroom has been created with a few rustic wooden logs. As you'll see here, it's best to avoid any complicated cabinetry and install some floor-standing taps. 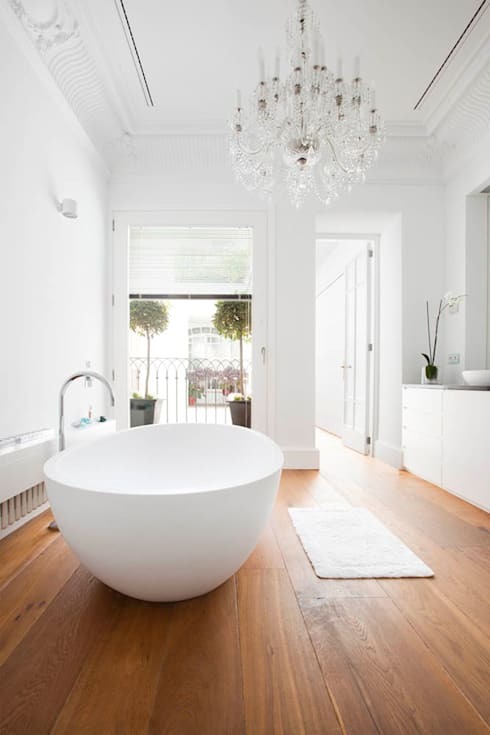 This beautiful bathroom is for those who have a lot of space, but the simple inclination to have a bath on display. We love the bathtub rack that holds a candle, soap and even a rose. But we chose this bathroom to show you for purely pragmatic reasons. The bath has been kept well away from the bedroom carpet because the two simply don't mix. Wooden floorboards as seen here are a good touch. But tiles or even slate would work as long as it fits seamlessly with other floor finishes. If you are concerned about the layout, consider hiring a professional bathroom designer to help plan the space. 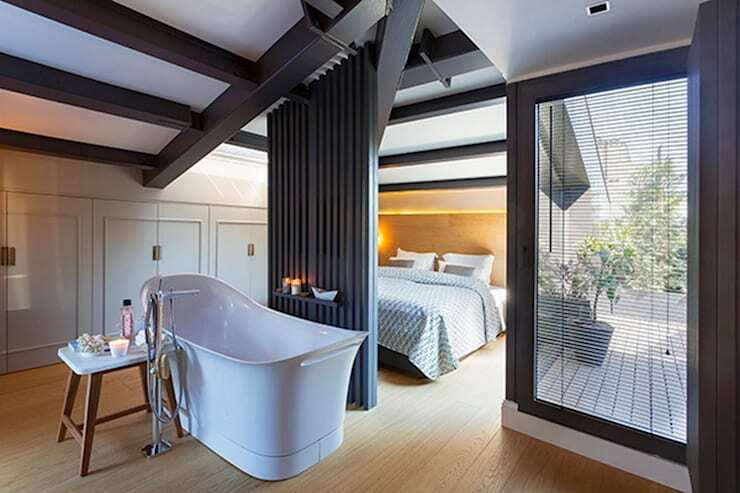 This glass enclosure is a good example of how a bathroom can be beautifully integrated into a relatively large bedroom decor. 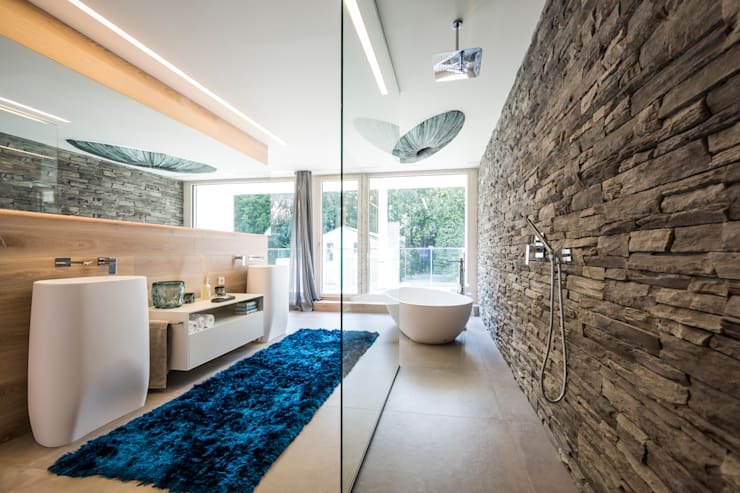 While the designers could have chosen to close the bathroom off completely and make a private bathroom, the result would have been a small, windowless bathroom and a small bedroom. This option is far better. It has a lovely slipper bath working as a display feature, allows for lots of light and makes the bedroom appear spacious and luxurious. Floor level showers are the latest trend. As seen here, it is a minimal look that enables one to enter the shower without stepping up and over that small lip in the floor. In this bathroom, a simple, clear glass shower wall has been added to complete the minimalist effect. This is not one for the shy among us. But when you consider that the bedroom is already the most private room in your home, an open bathroom and shower like this makes sense. Let's not forget that if you want an ensuite but don't have the money or space, a tub is a nice alternative to sharing with the rest of the family. After all this practical talk, we will now turn to the best part of having a bathtub in your bedroom. It's pure decadence! Explore adding a few vintage glamour items such as a chandelier or perhaps an old-fashioned wooden towel stand. This is a look that doesn't need much more than a great free-standing tub, thick towels and just a few accessories. Don't forget the candles too! 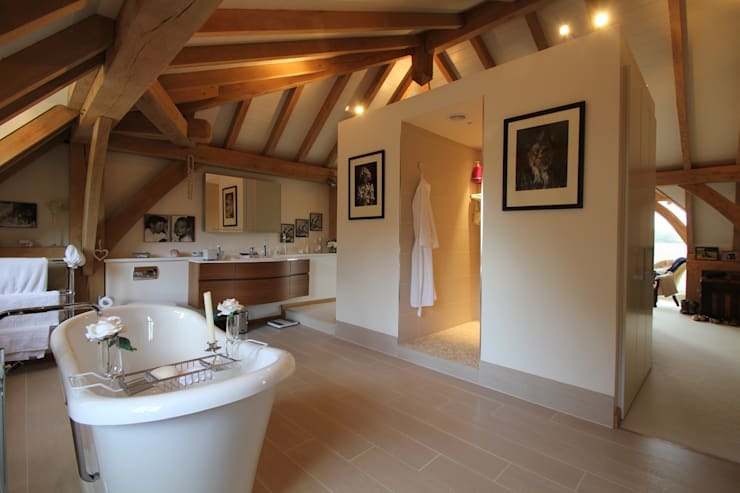 If you are interested in bathrooms, you will love this Ideabook Tips for creating a country style bathroom. What do you think of these decadent bathroom ideas? We would love to hear about your favourite in the comments below.